College career Yancy started playing organized basketball at the Saint Francis of Assisi College System Doves together with his brothers. The De Ocampo brother led the varsity squad to several NCRAA titles. 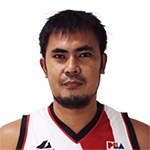 GlobalPort Batang Pier In June 4, 2014 Yancy De Ocampo and Val Acuña was traded to GlobalPort Batang Pier for Yousef Taha and Ronnie Matias. San Miguel Beermen De Ocampo was shipped to the San Miguel Beermen along with Gabby Espinas for Billy Mamaril and Doug Kramer. Player Profile At 6'9", he is a good outside shooter and a low post threat. He is also among the PBL's Top 20 Players of All-time. He was the first overall pick during the 2002 PBA draft and was the first-ever draft pick of FedEx as a PBA team. He is the older brother of Ranidel de Ocampo. He and Ranidel both played together since their college days at St. Francis of Assisi, with FedEx and with Talk 'N Text. In March 2010, he was traded to the Barangay Ginebra Kings but was trade immediately to B-Meg Llamados.